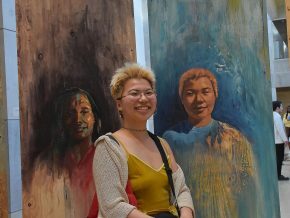 As part of the GIS Service Learning Laboratory course, Katy Hardt ’15 researched the wetlands, waterways and critical habitats of the northwest section of Middletown. 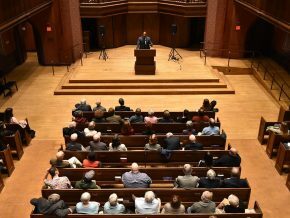 Hardt and fellow group members John Murchison ’16 and Catherine Reilly ’15 presented their findings to the Middlesex Land Trust. 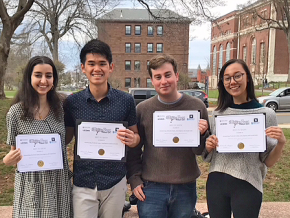 Five groups of students enrolled in the Geographical Information Systems (GIS) Service Learning Laboratory course E&ES 324 spent their semester helping local organizations learn more about land parcels in the City of Middletown. On Dec. 1, the students presented their research to fellow students, faculty, staff, community members and community partners. 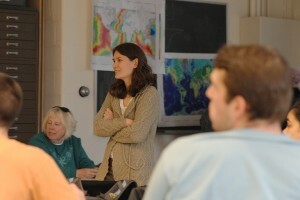 Kim Diver, visiting assistant professor of earth and environmental sciences, taught the class. Kim Diver, visiting assistant professor of earth and environmental sciences, taught the class, which included included lessons on geographic information systems (GIS) concepts and spatial data analysis and visualization. 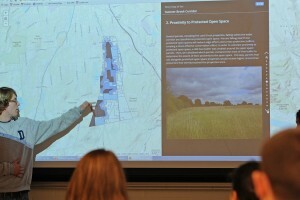 The students worked closely with community partners from the Middlesex Land Trust, Middletown Conservation Commission, the Connecticut Department of Energy and Environmental Protection and others to design a GIS, collect and analyze data, and draft a professional-quality report to the community. Angus McLean ’16 speaks about protected open space near the Sumner Brook Corridor in Middletown. 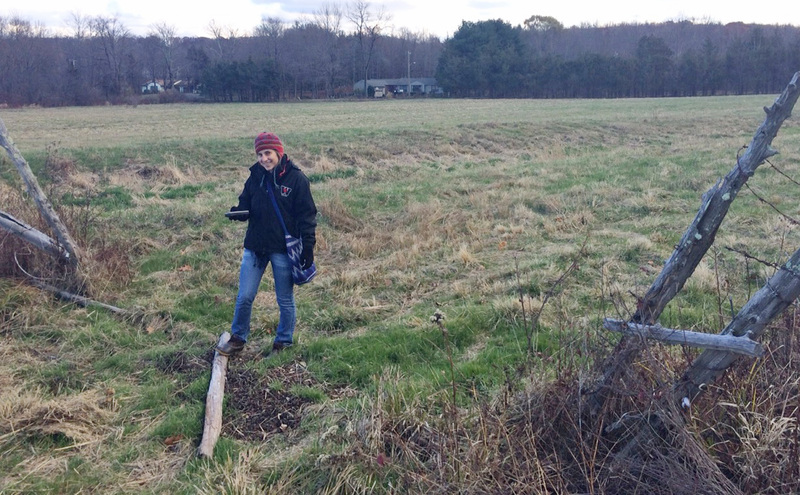 Erin McGrath ’16, Angus McLean ’16, Abrial Meyer ’16 , Dara Mysliwiec ’16 analyzed 355 land parcels in the Sumner Brook Corridor in Middletown based on eight factors to rank the parcels by importance to conservation. These included land value, elevation, proximity to water, wetlands, and open space as well as natural diversity, building cover and woodland cover. The data is generated for the Middlesex Land Trust to help in their acquisition of conservation property. John Murchison ’16, Catherine Reilly ’15 and Katy Hardt ’15 worked with the Middlesex Land Trust on a project titled “The Boardman Preserve Area Land Acquisition Assessment.” The students spent the semester analyzing parcels of land located in the northwest section of Middletown. The students used environmental data — wetlands, waterways and critical habitats — as well as ownership information, land value and location — to prioritize parcels near the Land Trust’s Boardman Preserve that the Land Trust may want to acquire and preserve in the future. During the group presentations, Katy Thompson ’15, Rebecca Sokol ’15, Chloe Holden ’15 and DeNeile Cooper ’15 discussed ways they’ve incorporated student-manged land areas into the Wesleyan campus maps. Katy Thompson ’15, Rebecca Sokol ’15, Chloe Holden ’15 and DeNeile Cooper ’15 worked with Wesleyan’s Physical Plant to create two updated versions of the Wesleyan campus map. 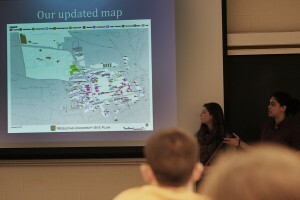 One map targets a Wesleyan-specific audience and includes student-managed land areas of campus, such as the Long Lane Farm and land managed by WILDWes. The students also created an online “story map” for visitors and prospective students. “The story map is more user-friendly than the Physical Plant map and prioritizes information interesting to a non-Wesleyan audience. Pop-ups provide blurbs, images and external links for buildings ranging from residential to administrative to dining,” Cooper explained. 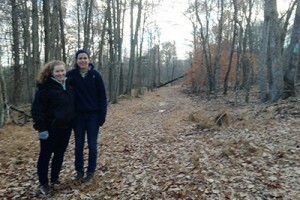 Tessa Hill ’17 and Sophie Breitbart ’16 analyzed five properties in Middletown including the Wesleyan Woods Preserve (pictured). Sophie Breitbart ’16, Mackie Hemphill ’15, Tessa Hill ’17 and Chloe Nash ’16 assessed the desirability of land parcels that the Middletown Conservation Commission may acquire and conserve for open space. They analyzed five properties in Middletown via factors such as proximity to city water and sewer systems, distance to most populous census tracts, and whether it’s within land designated as containing valuable protected habitats. Jeffrey Hauser ’15, Guy Davidson ’16, and Nolan Daley ’16 worked with Steve Gephard of the Inland Fisheries Division of DEEP to map dam locations and the water impoundment areas along the Coginchaug River for the purposes of fish habitat quality and migration.